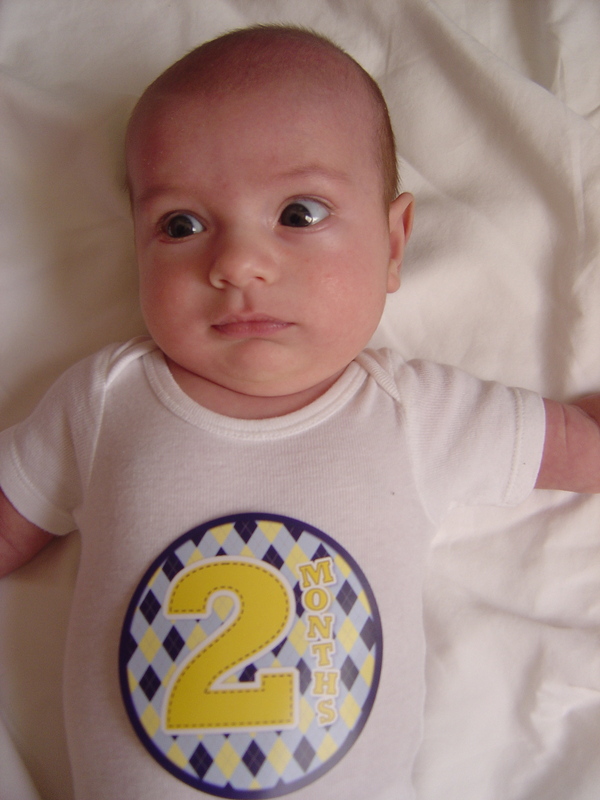 Henry, at two months you…. Are starting to get some of the hair back on the top of your head and still have gray eyes. 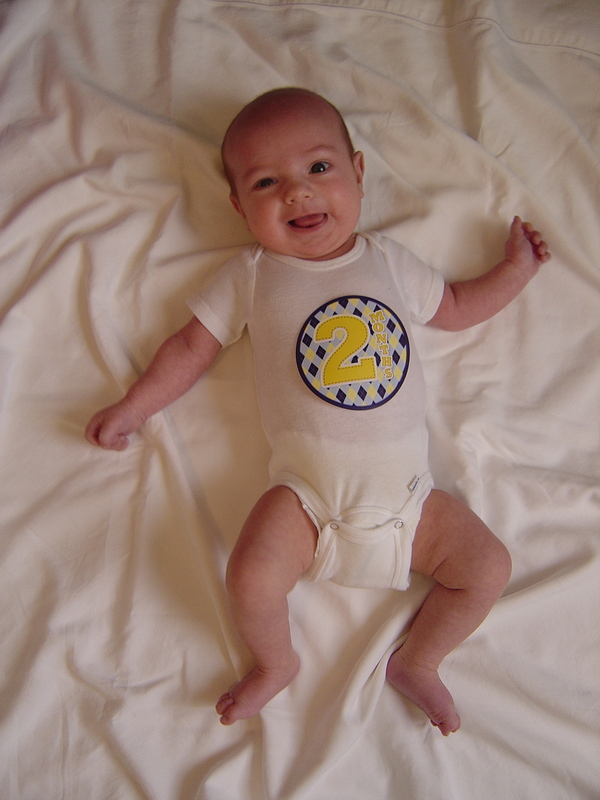 Are still long and skinny (12 lb 3 oz (52 percentile) and 24 3/4″ (98 percentile)). 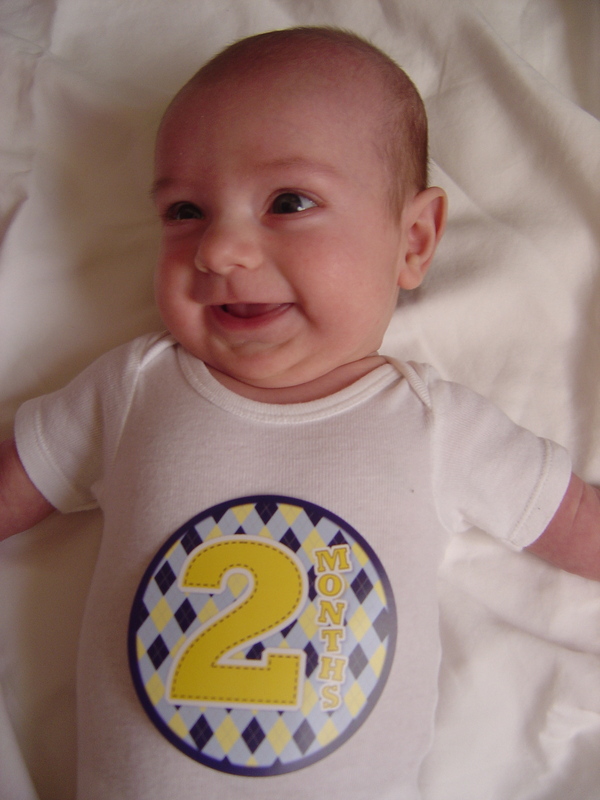 You are wearing 0-3 months. You were eating about every 3 hours during the day but now that you are exclusively nursing you have settled into eating every 2 hours during the day. Are having a tough time with acid reflux. You spit up all the time and cry about it. You started out taking Zantac and have recently switched to Prevacid. We try to keep you upright for 30 min after you eat and we have propped up one end of your crib mattress. Are a very fussy baby. It can take 30-45 min of crying before you fall asleep and then you will only nap for 10-30 min. You cry in the swing, in the stroller, in the car, in the carrier and even when we rock you in our arms. We tried swaddling, using a pacifier and playing a recording of a heartbeat. Nothing seems to work! Thankfully you still sleep for longer periods at night (usually wake up once) and even slept for 7 1/2 hours one time! Have moved from sleeping in your chair by our bed to your crib at the beginning of this month. Are happiest in the mornings. As soon as the sun is up you are ready to start your day. Are lifting up your head and part of your chest during tummy time and are starting to hold your head up better when we hold you sitting up. Just started to be interested in your mobile. You stare and coo at it. At first I didn’t think I was going to be able to get you to smile. You seemed board with my little photo shoot. ….your Dad came in and you were all smiles! Want to see how Henry has grown? Check out the previous month.